The dual-stage HSS724ACT is powered by an ultra-robust, GX200, 4-stroke, overhead valve (OHV) Honda engine. It clears a 23.8-inch (60.5-cm) path and throws snow up to 15 m (49,2 ft.). * It features a variable-speed hydrostatic transmission with Steering Assist Drive, which allows you to perfectly match ground speed with the snow conditions for optimum clearing efficiency and improves manoeuvrability with or without engine running with the new fingertip trigger steering control allowing precise turns for unmatched on-the-fly steering. 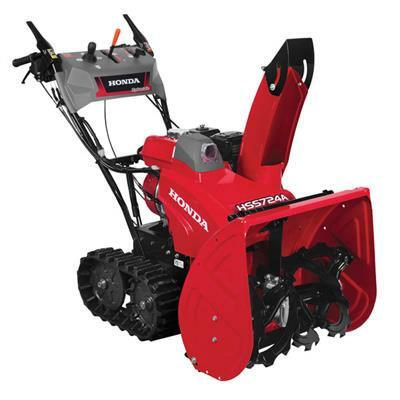 Other standard features include a variable, gas-assisted, auger-height-adjustment system, remote electric chute with "Joystick" control (Battery-less), a powerful LED headlight, quick-release auger, and drive-control levers that allow for one-handed operation, making chute adjustments possible on the go.